Looking for a dance class in Marin for your kiddos? Here is our guide to ballet and dance classes throughout Marin County for kids of all ages. New ballet classes start for winter in January or February, but usually you can join in any time. Some classes start as young as a year and a half, so there's no excuse for not getting the kiddos dancing at an early age! Many of these organizations, like Novato's Love2Dance and Rhythms offer classes for other genres of dance, from tap and jazz to hip-hop and contemporary. Joy of Dance Ballet offers dance classes for children and adults of all ages and dance ability. Classes start with the earliest ballet class (ages 2.5 years) and go primary ballet (ages 11 and up). 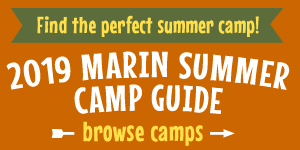 Locations: Classes at the Sausalito and Terra Linda recreation centers as well as at several Marin and San Francisco schools. For more information, call (415) 812-4821 or visit their website. Classes are offered for students beginning at age 4 in Ballet, Jazz, Tap, Hip Hop, Contemporary and Bollywood. The Just Dance Academy produces several performances per year, offers a dance competition program as well as specialty dance workshops. The Just Dance program has been in operation in Marin county for over 20 years and provides recreational and intensive dance training. For more info, call (415) 451-1734 or visit their website. Love2Dance offers ballet classes for ages 2 and up. From Little Feet Ballet for the younger ones to Intermediate-Advanced ballet for the older kids. Location: 830 Sweetser Ave. Suite A, Novato. For more info, call (415) 898-3933 or visit their website. Marin Ballet offers classes from pre-ballet for ages 3–7 to level nine for ages 12–18 in its six practice studios in its 20,000-square-foot facility near Dominican University of California in San Rafael. Classes are offered year-round. Location: 100 Elm Street, San Rafael. For more info, call (415) 453-6705 or visit their website. Marin Conservatory of Dance offers classical ballet classes for kids ages 4 and up. They are walking and biking distance from Mill Valley Middle School and Tamalpais High School, as well as Mill Valley elementary schools. For more info, call (415) 326-5117 or visit their website. Marin Dance Theatre offers classes from pre-ballet to advanced. Location: 1 St Vincents Dr, San Rafael. For more info, call (415) 499-8891 or visit their website. Mill Valley Recreation offers ballet classes for ages 3–13. Classes start with pre-ballet for 3–4 years old to continuing ballet for ages 10–13. Location: 180 Camino Alto, Mill Valley. Register: (415) 383-1370 or online here. Poise Ballet offers dance classes for boys and girls ages 3 and up. They provide a high standard training through the renowned Royal Academy of Dance international program. Classes start with Pre-School Dance for ages 3—4.5 years; continuing ballet for 5 + years old, and up to professional levels. Location: 403 Tamal Plaza, Corte Madera. For more info, call (415) 696-9526 or visit their website. Rhythms offers tap and ballet classes for all age groups as part of its Shine Your Way, starting with a mommy and me class for ages 2 and 3. Location: 1114 First Street, Novato. For more info, call (415) 898-9717 or visit their website. RoCo Dance, with studios in both Fairfax and Mill Valley, offers a variety of dance classes, including hip-hop, ballet, modern, jazz, and breaking. For ages 4 and up, depending on program. For more info, call (415) 456-1590 (Fairfax) or (415) 388-6786 (Mill Valley) or visit their website. San Anselmo's Stapleton School offers Magical Music & Movement for kids as young as 18 months, as well as early childhood creative movement, pre-ballet, and a full schedule of ballet classes for older children. Location: 118 Greenfield Avenue, San Anselmo. For more info, call (415) 454-5759 or visit their website. Tutu offers ballet classes from 18 months to 8 years. They offer classes from tutu toddler to primary ballet prep. Location: 1201 Larkspur Landing Circle, Larkspur. For more info, call (415) 380-0887 or visit their website.